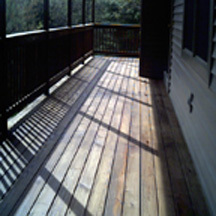 Below we briefly explain how your deck will be professionally restored, with superior, long lasting, beautiful results. Washrite re-finishes cedar, cypress, redwood, pressure treated wood and also decks built with exotic hardwoods such as mahogany, cambara, garapa, IPE, red meranti, mangaris and many more! 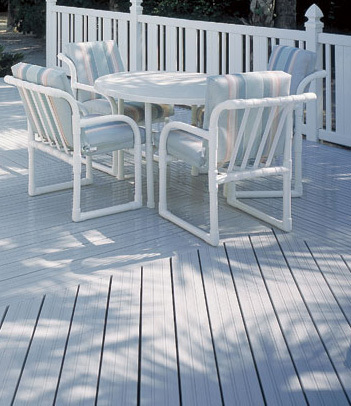 Our proven method of re-finishing is designed to provide you with the most superior, long lasting and beautiful deck possible. The products we use and our craftsmanship are the finest on the market today. 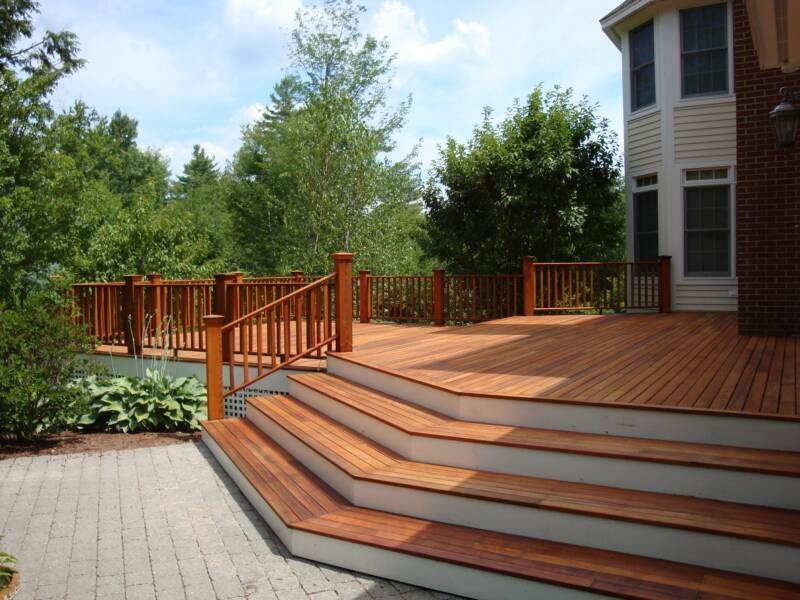 We take pride in our work and your deck. Please take the time to fully read the brief description below of the proven method we follow. Thank you for your interest and the opportunity to restore your deck. Fact : All Exterior Wood Needs Protection From Outdoor Weather ! unprotected wood begins IMMEDIATELY and lasts forever. Too many people spend countless hours and money building beautiful decks, fences and wood sided structures, then sadly watch them deteriorate because their wood is not protected from the devastating forces of weather. The damaging effects of sun, precipitation and temperature extremes on unprotected wood begin immediately. Morning dew, rainwater and melting ice or snow are quickly absorbed by unprotected wood, causing it to soften and swell. Direct exposure to the sun's heat causes drying, which makes wood shrink. Continuous cycles of wet and dry, swelling and shrinking, cause wood to warp, split, crack and check, all of which lead to premature wood degradation and expensive repairs. Unprotected wood is also subject to surface graying caused by constant exposure to the sun's ultra-violet rays. Persistent moisture exposure creates ripe conditions for the growth of mildew, mold, algae and other fungal organisms that feed on wood, eventually spreading across and staining the surface. Termites and other wood boring insects also use wood for a food source, causing ultimate wood rot and decay. If your deck is uncoated, it needs to be washed thoroughly using a product specifically formulated to gently remove the aged top surface layer. This product will rid the surface of its grayed appearance, ground-in dirt, stains from food and fungus growth, including mildew, mold and algae. We use an environmentally friendly low pressure cleaning system to safely remove dirt, mildew, and dead wood fibers to restore your deck to it's clean, natural, new appearance. Any screws or nails that have loosened or lifted are reset, missing screws or nails will be replaced. We sand the deck surface and top rail back to the original wood to enhance the appearance. Then we electronically test the wood for acceptable low level moisture content. Then to protect and beautify your deck into the future, Washrite will apply a professional grade semi-transparent stain/sealer to keep your wood deck looking its best. This 3 oil product has linseed oil, tung oils, mildewcide, UV protection and a high pigment content, which protects your deck with a long lasting, beautiful look. The high pigment formula penetrates deep into the wood's surface to lubricate, strengthen, and seal wood to form an excellent water barrier. Cedar, Redwood and Weathered Gray colors also have Carnauba added, which makes them absolutely the most superior of premium products we use. The semi-transparent stain/sealer has superior durability and long lasting protection against the harsh elements in New England. Please note that the natural is not a clear water repellent. Instead of the semi-transparent stain-sealer we can apply a clear water repellent or a solid color coating. 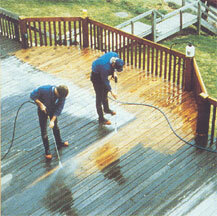 Your Washrite professional will gladly advise you on the proper product to protect your deck. The railing can also be finished in a solid bright white or any one of a variety of solid colors. A variety of 10 semi-transparent color choices are shown below. Once your deck has been restored, preserve the beauty and structural integrity of your deck by following through with our regular maintenance program. The story of Carnauba . . . The " Tree of Life "
The carnauba tree protects itself from the extreme climate of South America by producing the hardest natural wax known to man. The incredible durability of Carnauba gives this semi-transparent stain superior mar & scuff resistance. Carnauba blocks intense UV rays and holds up under extreme temperature changes. Carnauba is exceptionally long lasting and dries to a deep natural shine that does not cloud like other waxes. Carnauba is produced by a special palm tree that grows in the tropics of South America. Carnauba wax is harvested from the leaves cut from the trees. Only a maximum of 20 leaves each tree per year are cut, so that the tree is not endangered.
" Awesome! WOW! Says it all! Thank you! to our "new" deck that we thought was hopeless. When Washrite was finished it looked like a new deck. I can't believe our 17 year old deck came out so great. Thank you Washrite! Very happy with the results. " " We are very pleased with the workmanship and patience Gary has had with us. Our deck has been brought back to life. 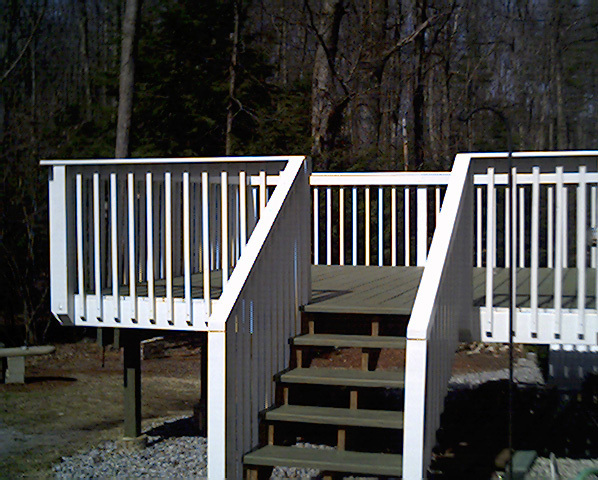 I fully recommend the semi-transparent stain/sealer for the deck and the solid bright white for the railing. " " We would like to say how great a job Gary at Washrite did with our deck. I tried it myself the year before and, thank goodness, Gary came this year to do it right. We recommend Gary and Washrite for a professional, clean and quick job. We'll be using Washrite again. " " Washrite provided prompt reliable and high quality service. Our deck has never looked so good! Better than we thought possible. Gary was accurate and timely with his estimate and with his service. Thank you "
"Outstanding job at a reasonable price. I had let my deck go for about 10 years and was amazed at how well it was restored." Washrite Professionally Restores Hundreds Of Decks . . .
"Using Technology To Beautify And Preserve Exterior Wood"
Is A Key Factor ! * Cedar, Redwood & Weathered Gray also have Carnauba for extra protection !
" Beware Do-It-Yourselfers! Three years ago I stained my deck with Behr stain, purchased at Home Depot. This year I did not make the same mistake again. I called Washrite, which stripped the gunky Behr stain off, sanded and restained my deck with a professional grade product." 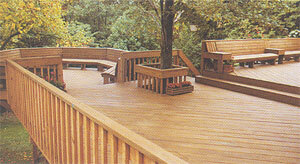 " Washrite went above and beyond the call of duty to refinish our large cypress deck. Washrite set all our nails and replaced a few. They then stripped and sanded our deck to bare wood. 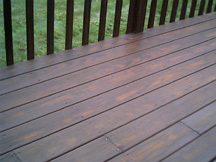 Next they showed us 5 samples of stain on our deck and later beautifully finished our deck to the sample of our choice. We will use Washrite again and would highly recommend them to anyone! " "Service was excellent ! Deck and siding look amazing - Excellent to work with, will use again in the future and highly recommend to others"
Great For Deck Railings ! 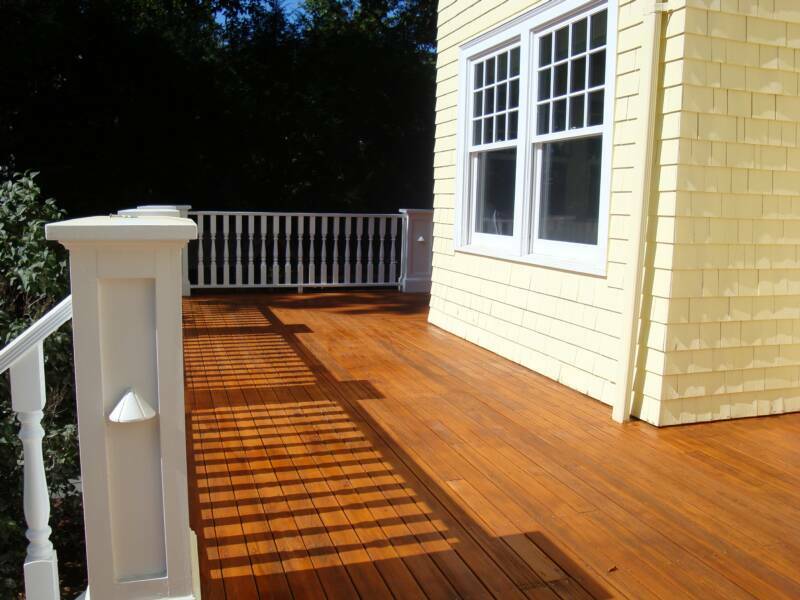 "We debated to rebuild or restore our deck and decided to go with Washrite. Gary was great and did a beautiful job. I would highly recommend Gary and Washrite."